Immigration restrictionists often claim that there are no "jobs Americans won't do," if only US borders would be secured against economic migrants who are willing to work hard for low pay and few benefits. If the fruit-and-vegetable industry couldn't rely on seasonal farmhands from Mexico and Central America, for example, growers would perforce offer the higher wages necessary to attract American citizens to pick the country's fresh produce. What alternative would they have? Let crops rot in the field? In reality, agriculture is no more of a zero-sum industry than any other, and there is no fixed number of people it must employ. That point is strikingly made by recent stories on the development of new technology poised to transform the nation's $2.5 billion strawberry business. While most grain crops in the United States have long been cut and gathered by giant combine harvesters, growers of strawberries have continued to employ human workers to pick a crop too delicate to be left to mechanized equipment. That was "partly to avoid maladroit machines marring the blemish-free appearance of items that consumers see on store shelves," as The Wall Street Journal noted last Friday. No less important was the "trained discernment" needed to select only the ripe strawberries from plants that also have immature fruit not yet ready for picking. Traditionally a large pool of farmworkers, mainly foreign-born, was available to supply that "discernment," along with the backbreaking effort involved in gathering crops by hand. But the number of unauthorized immigrants in the United States peaked in 2007 and has fallen markedly since. The wave of immigration from Mexico in particular has reversed: For the first time in four decades, the Pew Hispanic Center reported in 2012, more Mexicans were leaving the United States than entering. From the standpoint of strawberry farmers, it doesn't much matter whether the dwindling of migrant labor is due to tougher border enforcement in the United States, better economic prospects in Mexico, or some other factor. The farmers' overriding concern is that the fruit must be harvested, and they can no longer rely on immigration flows to get the job done. Nothing to do, then, but boost the pay and perks for strawberry-pickers until they're high enough to induce more US citizens to work in the fields? Far from it: With human workers harder to find, strawberry growers have become increasingly committed to finding a technological solution. The Journal story describes the Agrobot  a prototype of a 14-arm automated harvester that couples vision sensors and advanced software in a device capable of "pluck[ing] ripe strawberries from below deep-green leaves, while mostly ignoring unripe fruit nearby." When migrant labor was plentiful, the Agrobot's $100,000 price tag would have seemed exorbitant. Now it increasingly looks like a sound capital investment. The Agrobot is only one entrant in the race to revolutionize the strawberry industry. Another competitor is Harvest CROO Robotics. The Florida-based engineering team is at work on a high-tech harvester able not only to pick ripe fruit at the rate of one per second per mechanized arm, but also to run continuously for an entire day. 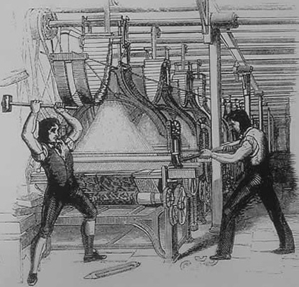 Luddites in the 1800s smashed weaving machines to prevent the new technology from putting laborers out of work. Secure-the-border hardliners regularly claim that immigrants "steal" jobs that would otherwise go to US citizens. But if migrant workers reduce employment opportunities for Americans, don't robotic harvesters and every other labor-saving technological improvement? Shouldn't immigration restrictionists, so intent on protecting US workers from the competition of foreign immigration, seek just as intently to protect them from new technology? Such an argument seems manifestly crazy today, when all around us is evidence of the myriad ways in which technology multiplies wealth and increases employment. Yet there was a time when Luddites smashed machines to prevent them from putting laborers out of work. We understand now that for every job technology makes obsolete, a dozen  a hundred, a thousand  new jobs are created, often in fields that until then never even existed. Any society that cuts itself off from labor-saving technology needlessly harms itself. The same is true of a society that cuts itself off from an influx of willing and peaceful workers. Free minds and free markets constantly come up with innovative ways of accomplishing old tasks  even a task as old as picking fruit. Our best bet isn't to stifle those minds and markets, but to liberate them. Strawberries and strawberry fields may be forever. But the strawberry industry, like every industry, changes. If those changes make it more productive, the whole economy stands to gain.